Thanks to the 3 J’s: Jeff, Jordan, John ! This charming stove can be found on display in the DeWitt Wallace Decorative Arts Museum in Williamsburg, VA.
“Perhaps the most prominent building in Colonial Williamsburg is the reconstructed Governor’s Palace. The palace was the official residence of Virginia’s royal governors, and also served to bring royal grandeur to the colony. The governors reflected the king’s majesty through rich furnishings, an imposing display of weapons in the front hall and staircase, lavish entertaining, and the latest in technological home improvements. 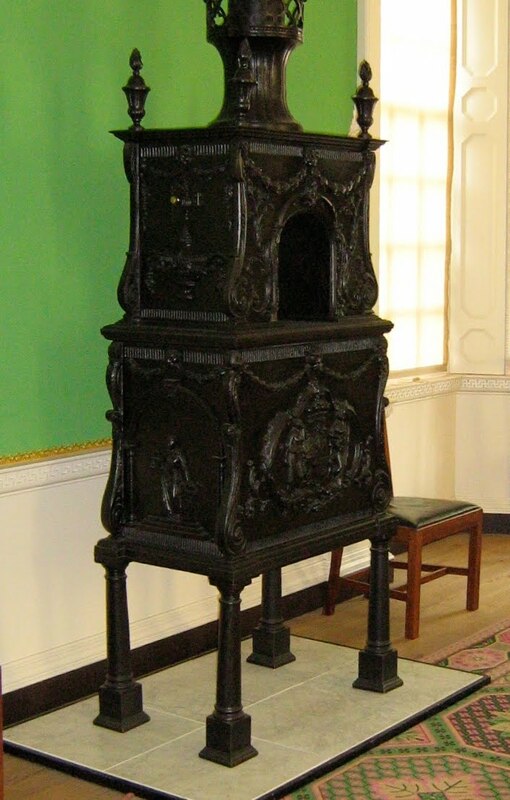 For Norborne Berkeley, 4th Baron Botetourt, and royal governor of Virginia from 1768-1770, this included the towering (it’s over seven feet in height) cast-iron stove, left, ordered from London in 1770. Also called “warming machines,” coal-burning cast iron stoves like this were popular in elite homes in London, where they were prized for being effective, fashionable, and exclusive because of their cost. The stoves were the work of a famous inventor of the time named Abraham Buzaglo (1716-1788.) A Moroccan who immigrated to England in 1760, Mr. Buzaglo immediately amazed Londoners with his cast iron warming machines, which he patented in 1765. Mr. Buzaglo’s trade card modestly promised that his stoves “surpass in Utility, Beauty & Goodness any thing hitherto Invented in all Europe”. They “cast an equal & agreeable Heat to any Part of the Room, and are not attended by any Stench,” with “a bright Fire to be seen at Pleasure.” More importantly, the stoves”preserve the Ladies Complexions and Eye Sight” and “warm equally the whole Body, without scorching the Face or Legs,” plus “other Advantages too tedious to insert.”* The stoves were also considered decorative, covered with lively rococo and classical motifs, and featuring urn-like finials topped with flames. The warming machines were so popular that they became known by the inventor’s name (though incorrectly, if inevitably, pronounced by the English as “Buzz-aglow” rather than “Bu-ZAH-glo”.) Buzaglos warmed drafty gracious homes as well as university libraries and the shops of tailors and weavers. The original stove helped heat the Palace, and was so successful that Lord Botetourt ordered an additional one for the House of Burgesses. When Richmond became the seat of the new commonwealth’s government in 1780, the stove was taken across the state to help warm the Richmond Capitol well into the 19thc. In 1933, it was returned to Colonial Williamsburg on a long-term loan, and now can be found on display in the DeWitt Wallace Decorative Arts Museum. Two modern reproduction stoves – one is shown right – stand in the ballroom of the Governor’s Palace.